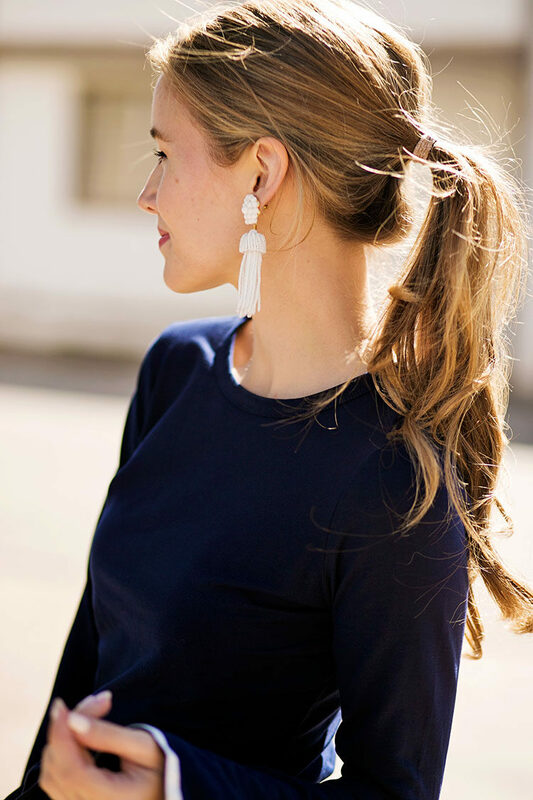 This navy top is one that immediately caught my eye. How about those sleeves? They made for that southern, fun and slightly preppy feel that I absolutely love wearing. To contrast the long sleeves, I paired it with the cutest pair of navy shorts, and love how the resulting look resembles a romper! 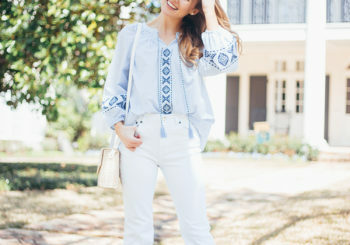 The fun thing about this ensemble is you can mix and match the top and bottoms to create a few other darling spring looks. Try wearing the top with a white denim skirt or white flare jeans, and add a simple white tee or an off the shoulder blouse to turn the shorts into a perfect weekend look! Ok, y’all… the day is here! I am jumping on a plane with my mama this morning and headed somewhere warm and colorful! Be sure you’re following along on Instagram and Snapchat (LonestarSnaps) to see where we’re off to! Love the top! Have a great trip with your mama! This romper is so fun girl! The sleeves are a little bit too much for me (I would love it if the sleeves were 3/4 and a little smaller) but I LOVE the shorts and sandals. PS: More coffee dates, please. :) Love reading them. That top is gorgeous! The sleeves are amazing, so pretty. I LOVE this pairing! It totally looks like a romper. I love this shirt!!! I got it from SheIn for $9!!!!! and it’s amazing quality! Can’t wait to see where you are off to next! Snap us tons!!!!!! This look is so cute! I never would have thought to put them together, but it is amazing!! Have a great trip!! This entire outfit is so amazing! What a cute cute look! Passes as a romper hehe ;) without the difficulty of an actual romper. I totally thought this was a romper until I scrolled down! They go together so perfectly! Love this look, you look so nautical and fun! This top is so cute and I love how you paired it with those shorts!